Researchers at the University of Miami Miller School of Medicine discovered a biomarker that puts patients at a higher risk for metastasis of uveal melanoma, a type of eye cancer. Among uveal melanomas categorized as class 1, those with high levels of the biomarker PRAME mRNA were more likely to metastasize than those with low levels of PRAME mRNA, indicating that patients with this biomarker be monitored more closely for metastatic disease. The estimated 5-year rate of metastasis was 0% for PRAME mRNA-low class 1 uveal melanomas and 38% for PRAME mRNA-high class 1 uveal melanomas. This research builds upon J. William Harbour's identification of class 1 and 2 uveal melanomas in 2004. The team's study (“Defining a New Prognostic Index for Stage I Nonseminomatous Germ Cell Tumors Using CXCL12 Expression and Proportion of Embryonal Carcinoma”) is published in Clinical Cancer Research. 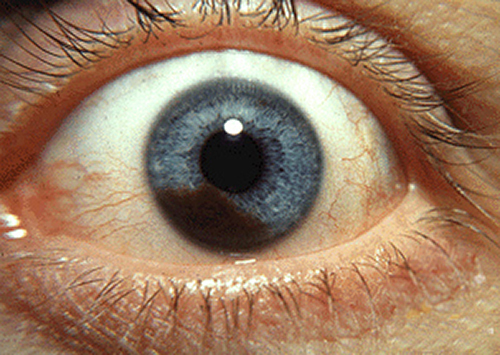 There are about 2000 to 3000 cases of uveal melanoma diagnosed each year in the U.S., according to J. William Harbour, M.D., associate director for Basic Research and leader of the Eye Cancer Site Disease Group at Sylvester Comprehensive Cancer Center at the medical school. He explained that uveal melanomas are categorized into class 1 and class 2 tumors by gene expression profiling and that class 1 tumors have a much lower chance of metastasizing than class 2 tumors. “However, about 10% of patients with class 1 uveal melanoma do develop metastasis,” said Dr. Harbour. “The main purpose of this study was to identify a clinically useful biomarker for this subgroup of class 1 uveal melanomas, which in turn might help in the development of precision medicines for melanoma patients. Dr, Harbour and colleagues performed genome-wide analysis of mRNA isolated from five class 1 uveal melanomas that metastasized and eight class 1 tumors that did not metastasize. The most highly overexpressed mRNA in the tumors that metastasized was PRAME. Further analysis of PRAME mRNA levels showed that seven of seven class 1 tumors that metastasized had high levels of PRAME mRNA and that 16 of 19 class 1 tumors that did not metastasize had minimal levels of PRAME mRNA. To validate the association between high levels of PRAME mRNA and metastasis for class 1 uveal melanomas, the researchers analyzed two additional datasets. The first was a combination of two independently published datasets and the second was a dataset from Leiden University in The Netherlands. In both datasets, PRAME-positive tumors had a significantly increased risk for metastasis compared with PRAME-negative tumors. Dr. Harbour noted that because this is a retrospective study, meaning that the researchers identified PRAME by looking back at patients who had been treated in the past; they are planning a prospective, multicenter study to validate the findings. He explained that the class 1/class 2 gene expression profile test remains the only prognostic assay for uveal melanoma that has ever been validated prospectively in a multicenter study and that they will hold PRAME to this same high standard of prospective validation.